I grew up in rural Polk County Florida and for as long as I can remember my Mom and Dad kept vinegar on the supper table. We put it on a lot of foods including collard and turnip greens, cabbage, black-eyed peas, black beans and rice, lima beans, cauliflower, spinach, fish, and pork to name a few. It’s tasty, low calorie, and brings out the flavor in foods! My Bootleg Red has taken simple vinegar to the next level and made it even better. If you like that taste you will love this. Truth be told it is my personal favorite sauce for barbecued pork and beef. And it goes great on all kinds of side dishes too. If you’re ready to try a change from the traditional thicker and sweeter barbecue sauces, give it a try and see what you think. A little is all it takes. We hope you like it! 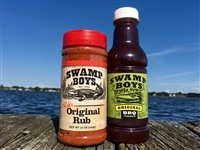 This Swamp Boys Original BBQ Sauce is the culmination of a lifetime of barbecuing and cooking in Florida. Add to that the experience from competing for more than 12 years against the best professional barbecue teams in the country and you get the amazing sauce we have today. My sauce is like the great state it is from - a strong influence from old Florida and the South, along with influences from those who have settled here from around the country. It all comes together to create a balanced, thinner sauce that defines Florida style barbecue. It compliments not only traditional barbecued chicken, pork, and beef, but also fish, hamburgers, meatloaf, and potatoes. It’s even great in a Bloody Mary and soups! Thanks for giving us a try and we hope y’all love it. You asked for it you got it! After 10 years of hard use and abuse I had to replace the steel tread plate floor in my competition trailer. To my surprise, some of my fellow competitors were asking for chunks of this old steel, feeling it held a lot of BBQ MOJO. So enter the fully functional bottle opener. Genuine Swamp Boys trailer floor, repurposed to live another life. Each one is unique. Get your piece of history before they are all gone. I came up with this rub back in 2004 and have been using it ever since. It is the rub that helped me collect the most 1st place rib wins in the country over a 6 year period from 2004 - 2010 according to the now-retired National BBQ Rankings. This is the same rub I used on BBQ Pitmasters. This rub has never stopped winning. Rub N' a Pint - 25% OFF! Rub n' a Pint n' a Flask - 25% OFF! Rub N' a Quart - 25% OFF! This is one of the most winning combinations in barbecue! And to help get the word out, for a limited time you can try it for 25% off. Find out for yourself why judges and people across the country have loved it for over 10 years. Take your ribs, chicken, and pork from good to OMG! *Usage Tip: Don't over do it with the rub. Use a medium layer at first and adjust for amazing results. UPDATED - NOW SHIPS FOR JUST $7.00 to lower 48 states! 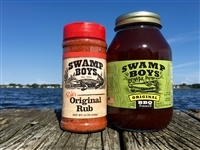 The best from the Swamp Boys BBQ team! Our rub and sauces that are used by some of the top ranked teams in the USA, combined into this great gift pack. One 12oz Rub's Original Rub, one pint Swamp Boys Original BBQ Sauce, and one 7.5oz flask Swamp Boys Bootleg Red. And at 25% off! This is one of the most winning combinations in barbecue! And to help get the word out, for a limited time you can try it for 25% off. Find out for yourself why judges and people across the country have loved it for over 10 years. Take your ribs, chicken, and pork from good to OMG! Buy in bulk and save over $24! 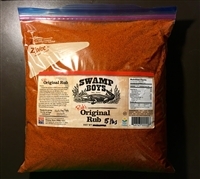 Five pounds of Rub's Original Rub packaged in a one gallon resealable bag. For the serious competitor or backyarder this is the way to go. Six (6) of my 12 ounce shaker bottles. Four and a half (4.5) pounds of Rub's Original Rub to get the job done. And 20% off. Because you're smart.